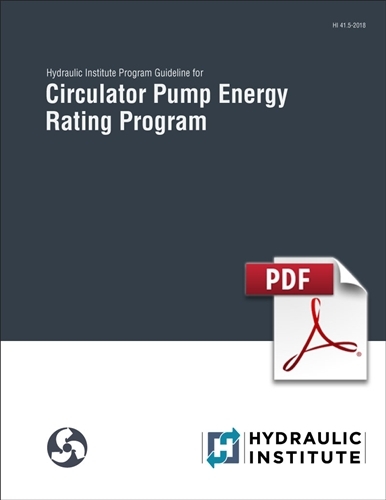 The Program Guideline establishes the method for testing circulator pumps consistent with the circulator pump Appliance Standards Federal Advisory Committee (ASRAC) working group Term Sheets, which are intended to be the basis of the U.S. Department of Energy (DOE) testing procedure, determine an Energy Rating value, and requirements for listing circulator pumps in the ER Program. The scope of pumps included in the ER Program are limited to clean water circulator pump types CP1 (wet rotor), CP2 (dry rotor two-piece), and CP3 (dry rotor three-piece) as defined in this guideline. The Energy Rating (ER) provides a method to estimate energy savings, but realized energy consumption will depend on the individual installation, operation, and control mode chosen. The ER metric can be used by utilities and energy program administrators as part of a program to provide incentives for selection of circulator pumps that, when properly applied, should result in lower overall energy use.